While I was solving a programming competition question, I came across a technique advertised as suitable for the solution. 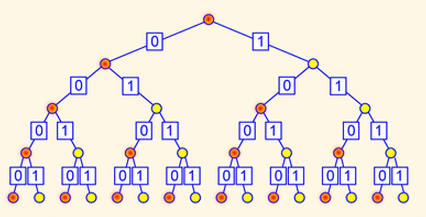 A so called Fenwick tree (a.k.a binary indexed tree) was at the heart of this technique. So in an effort to understand Fenwick trees, I researched all online sources in vain because reading them in details is a pain! No one seems to be able to explain the main concepts behind this data structure in a concise and clear way. Can anyone please give a high level exposition of the main ideas related to Fenwick trees without going into unnecessary details? 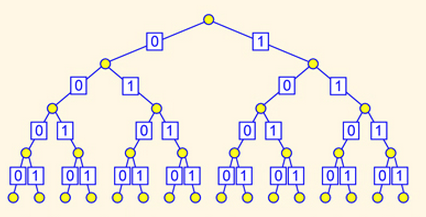 A Fenwick tree is a binary tree used to efficiently handle cumulative frequencies or sums in an array. This is the so called Fenwick tree (or binary indexed tree). As can be seen, all the leaf nodes are indexed by a 4-digit binary number from 0000 till 1111 (left to right). Don't worry about this indexing for the time being. Now suppose that every leaf node contains the numeric value of its mapped array element and that every non-leaf node contains the sum of its two children. This means that the root node of the tree will contain the sum of the whole array. Also the left(right) child of the root will contain the sum of the left(right) half of the array and so on and so forth. Up till this point we haven't really done anything special apart from storing partial sums. What we really want to do is to use these partial sums to compute cumulative sums in the array. We can do this for example by carefully selecting some nodes and returning their sum. This poses the question: Is there a strategic way to mark some nodes of the index tree that allows efficient cumulative sum calculations? It turns out that there is and this is the main idea behind Fenwick trees. Before describing this marking, we first elaborate on the concept of uniform arcs. 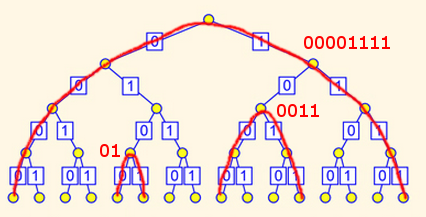 A uniform arc in a binary indexed tree is a directed path from any leaf to any other leaf situated to its left such that the labels on this path have the form: "00...011...1" (read from left to right). We can also assume the existence of a uniform arc from every leaf node to itself (with a length of 0). For example, the uniform arc connecting the fourth leaf to the first has a label of "0011". See the following figure for some illustrative examples of uniform arcs. You can verify the above examples by direct visual inspection of the third figure. 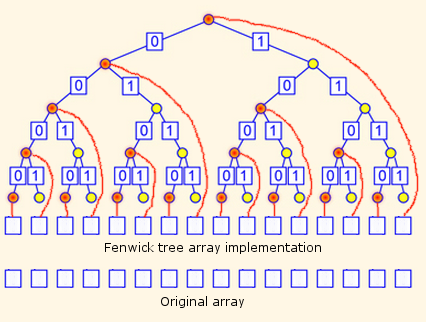 A detailed explanation of Fenwick trees can be found at BIT: What is the intuition behind a binary indexed tree and how was it thought about? and https://www.topcoder.com/community/data-science/data-science-tutorials/binary-indexed-trees/. Hopefully by now reading the mentioned sources will be much easier. Not the answer you're looking for? Browse other questions tagged data-structures binary-trees or ask your own question. What is the depth of a complete binary tree with $N$ nodes? Why isn't the time complexity of constructing a Fenwick tree tighter than $O(n\lg n)$? What are these tree transformations called? What are drawbacks of Tree Sort algorithm (with balanced tree) vs Tree Sort (with unbalanced tree)?